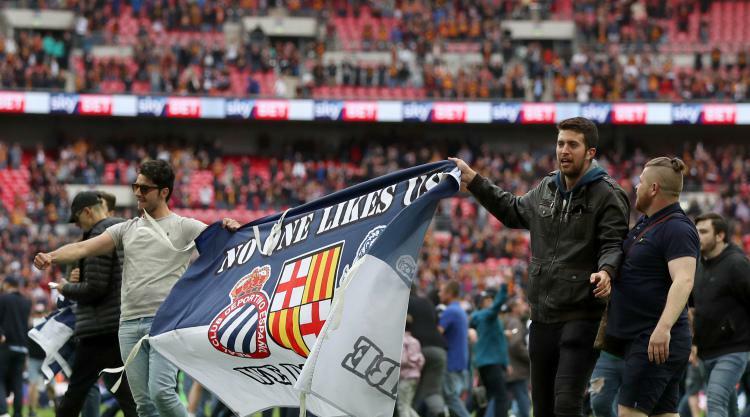 The English Football League has called for police to take action against "mindless" Millwall fans who invaded the pitch and confronted Bradford players following Saturday's League One play-off final. Lions supporters spilled on to the Wembley turf after their side sealed promotion to the Championship with a 1-0 victory over the Bantams. The EFL has condemned the unsavoury scenes and wants Wembley to work with Millwall and the Metropolitan Police in order to identify those involved. "It is a criminal offence to enter the playing area and, whilst some of those who made the decision to break the law did so to celebrate their team's success back to the Championship, a mindless few opted to goad the Bradford City players," an EFL statement read. "Their actions were completely unacceptable and will not be tolerated by the EFL. "The EFL will be encouraging Wembley to work with both the Metropolitan Police and Millwall to identify those whose behaviour created the most concern on the day and to take the necessary and appropriate action. "The EFL will also raise a number of concerns with Wembley as to how the fans were not only able to access the playing area but then able to get so close to the Bradford City team, who showed great restraint given an incredibly challenging and difficult situation. "We cannot allow a set of circumstances to exist where the playing area becomes an appropriate place for fans to celebrate and Wembley, like stadiums across the country, have to be prepared to deal with the type of events that emerged on Saturday efficiently and effectively so as to ensure there is no repeat."